Agnes: You flatter like a lieutenant. Are you? Max: Would you like me better if I were? Agnes: I never said I liked you at all. Erich von Stroheim had the most unusual love-hate relationship with the Hollywood studios during the 1920s. He was certainly the man you turned to if you wanted an opulent, impressive production. On the other hand, once studios saw what a von Stroheim vision of opulent and impressive could and did cost, he was often summarily fired and his pictures finished by others. Such was the case with this 1923 picture, which von Stroheim not only cast and designed for production, but he had even directed several months of shooting before the reins were seized and handed over to the more unexciting but budget-oriented director, Rupert Julian. The setting is Vienna just before the outbreak of World War I. Nobleman Maximilian von Hohenegg (Norman Kerry) is betrothed to cigar-smoking society woman Gisella Von Steinbruck (Dorothy Wallace). 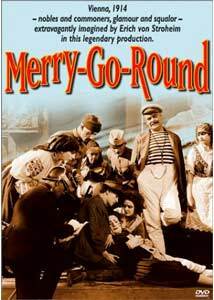 A chance trip to the Prater, the Viennese amusement park, brings Max into contact with Agnes Urban (Mary Philbin), an organ grinder for the merry-go-round operated by the tyrannical and abusive Schani Huber (George Seigmann). Max poses as Franz Meier, a necktie salesman, in order to toy with Agnes' affections. But before long he genuinely falls in love with Agnes and is about to break off matters with Gisella when the Emperor (Anton Vavenka) orders him to go through with the long-planned nuptials. Broken hearts, recriminations and general unhappiness ensue. If the juxtaposition of Kerry, Philbin, and Rupert Julian sounds familiar, that's because two years later the three of them would be reunited in Phantom of the Opera, with Lon Chaney. Julian's static and boring style is also evident here; one can pick out quite a few sequences and declare with confidence who actually directed them based on their visual imagination. Of course, it's easy to fling mud at Julian, but the script has its own issues as well. The recurring image of the "merry-go-round of life" being controlled by some being (God? Satan? Fate? Pan? It's never quite clear) is quite over the top in its pretension. Yes, we get the symbolism the first and second time we see it, as if the title hadn't given us a significant clue. Someone's trying way too hard to be artsy here, and it feels clumsy instead. An unfortunate excess of improbable coincidence betrays the picture's melodramatic substance, which doesn't exactly mesh well with its high art claims. The acting is passable for these contract players. Kerry is best at playing a stiff, and that's what he's called on to do here. His repentance isn't entirely convincing, but his callous disregard for the feelings of others works just fine. Philbin is rather hit-and-miss. She's quite enjoyable when being coy, shy, and charming, but when called upon to give much of a range to her performance she just starts wildly overgesticulating as if she were in a parody of a silent movie. The one significant exception is when Schani is terrorizing her in the closed-down merry-go-round; in this segment Philbin's incredibly convincing as someone in fear for her virtue if not her very life. One suspects this may have recommended her for the lead in Phantom. The supporting cast is the strongest suit of the picture. Seigmann is a thoroughly nasty villain and his use of his economic power to abuse and harass his workers for sheer pettiness comes through well. Most of the unforgettable sequences of the film involve him, whether when he's telling Agnes to smile as he crushes her foot, or pursues her in the dark with evil intent, not to mention his Poe-influenced comeuppance. Also notable are George Hackathorne as Bartholomew, the hunchback who loves Agnes from afar, Dale Fuller as Huber's abused and terrorized wife, and Cesare Gravina as Agnes' father. The music by Brian Benison is derived from the original score. Predictably, it relies heavily on Strauss waltzes. The music is quite suitable for the opulence and decadence of the aristocratic classes here, with their unimaginable gilt and waste on the eve of war. In stark contrast is the desperate living situation of the Urbans, in poverty and constant fear. While the central romance is disposable at best, the drama inherent in these evils is palpable on the screen and gives the picture whatever power it still has today. Image Transfer Review: Unfortunately, no 35mm source material of this picture seems to be extant any more, and the DVD is derived from a 16mm print instead. However, it's a rather good print for the most part. Though lacking sharp definition, there are some textures that come through well enough. Film warpage is a little distracting in two or three short segments, and the expected scratches for an 80-year-old film are all present and accounted for. The daylight scenes are sepia tinted, while the night segments are a blue that is often a bit on the heavy side. On the positive side, the artistically rendered intertitles are presented intact here, without freeze-framing as is so often the case. Considering the fact no first-rate source material is known to exist, this looks as good as one can reasonably expect. Audio Transfer Review: Brian Benison provides a synthesized orchestral score with some organ segments. The synthesizer isn't bad, but it's clearly not a genuine orchestra. The audio quality is decent, without hiss or noise. There's plenty of surround activity and decent bass presence overall. Extras Review: Other than a static menu with insufficient chapter stops, there's nothing at all for extras. A moderately entertaining drama that pours on the symbolism and purported deep meaning a bit too heavily, but it's redeemed by some genuinely memorable sequences and good supporting performances. A decent transfer, but zero extras.